Table 3 of CSIRO & Standards Australia Hand Book HB 197, An Introductory Guide to the Slip Resistance of Pedestrian Surface Materials, suggest both ramp or pendulum slip testing classifications, however it shows no bias. It is important to understand that tribometers (slip testing meters) measure the friction of the two interacting surfaces and any solid or liquid medium within the system. Different footwear in combination with different contaminants will provide different slip testing results. As such, there is no direct correlation between these four slip testing methods. For example, it seems nonsensical to specify a surface using the oil wet ramp slip testing method for external walkways and entry foyers, where the most likely contaminant will be water and many people will be wearing shoes that may have a hard soling compound and a worn tread pattern. 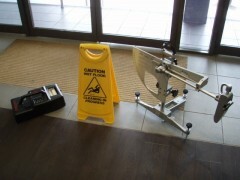 In this instance the wet pendulum slip testing method is more appropriate. Oil wet ramp slip testing (R Classification), which uses safety boots with large volumetric tread pattern and high viscosity motor oil, seems to be of little relevance for normal conditions (that the general public will normally encounter). Additionally, the ramp slip testing methods cannot be used in situ, thus these floor test methods can only be used to evaluate the selection of proposed floor surfaces. If there is a dispute regarding an installed surface or a incident occurs, only pendulum slip testing and dry FFT slip testing methods can confirm the onsite performance. An example of potentially hazardous situation that commonly arises is when an R10 product is specified externally and does not achieve a minimum of pendulum class W as recommended in HB197. This situation is usually discovered during the first few periods of rain on new developments. Although the ramp slip testing indicates that the surface may be suitable, pendulum slip testing can identify that the product has inadequate slip resistance. Many instances have identified R10 rated products achieving the lowest pendulum slip rating. 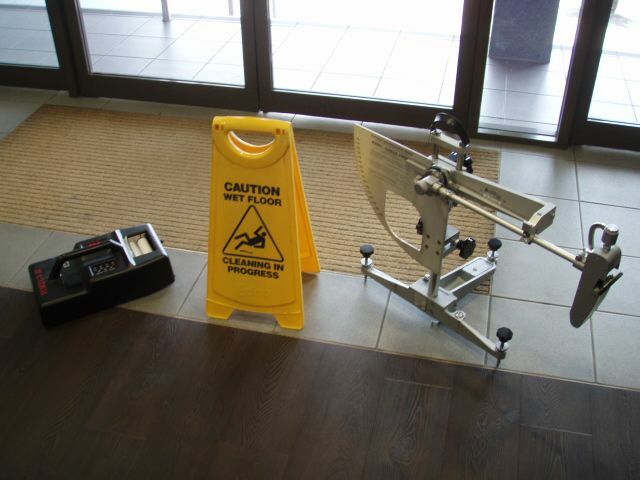 Onsite slip testing using the pendulum then confirms the lack of slip resistance, which can also be compounded by any reduction in slip resistance during and after installation.